Dirt Connections is dedicated to offering a quality of service that you can count on to keep your family and your investment in your home safe and secure. We are well aware that the first line of defense against inclement weather is a strong and durable home exterior. Unfortunately, the most vulnerable components of your home during a severe weather event are often not the most visible. A solidly built and well-maintained roof is key to protecting the interior of your home from the elements, yet many homeowners treat their residential roofing needs with an “out of sight, out of mind” mentality. In order to protect your home, it is essential to know the status of your existing roof, and the options available for fixing any issues before a little problem becomes a big one. Depending on the current status of your roof, either re-roofing your entire home, or site-specific roof restoration may be necessary. Re-roofing is when the roof is too damaged to repair piecemeal and the entire thing must be replaced. This is often necessary on older homes that have not received regular roof maintenance and have fallen into disrepair. 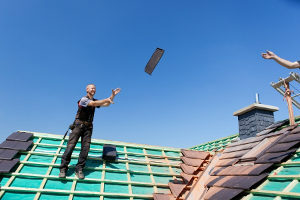 Although undertaking a re-roofing project may seem daunting Dirt Connections’ team of skilled contractors have years of experience in re-roofing homes of all sizes quickly, while never sacrificing client comfort in their homes. Roof restoration is used for homes where the roof is damaged only in spots, and the damaged components are not significant enough to warrant an entirely new roof be applied. During a roof restoration, a skilled roof inspector will assess the existing roof components for damage, then mark off areas needing repair. Once the problem areas are addressed and the roof’s overall safety and functionality is assured, the entire roof is then repainted and recoated to give the entire home a uniform, new-roof look. Re-roofing is undertaken when the entirety of the roof must be replaced to ensure the home is safe and secure during all types of weather conditions. Although often larger-scale and more expensive than roof restoration projects, re-roofing has a number of immediate benefits. A new roof is a great way to improve the look and value of your home while simultaneously increasing your home’s livability and safety. Should you decide to sell your home, your recently re-roofed house will pop-out to potential homebuyers and offer a boost to your home’s market value. When re-roofing a home, contractors and designers have an increased ability to customize the project when compared to roof restoration. A re-roofing project is a perfect opportunity to change other components or your home, including alterations to attic spaces and upper rooms. By re-roofing your home, you ensure the entire roof system is updated all at once to the same quality. This can improve your entire home’s durability for decades, avoiding the need for potentially costly repairs to other home components should the roof fail. Roof restoration allows the contractor to target specific problem areas to improve roof safety and increase longevity. By focusing and prioritizing problem areas, the roof restoration project can improve your roof on a short timeline with immediate results. Because roof restoration projects are minimally invasive when compared to whole re-roofs, these projects do end up costing less. The team of contractors at Dirt Connections have years of experience providing roof repairing solutions that fit any budget and make an immediate difference. By repainting and recoating the entire roof after problem areas are addressed, your roof restoration project will make your whole house look fresh and revitalized, even though the houses bones are still mostly the same. A safe and sturdy roof is vital protecting your home’s interior, and your family from the elements. 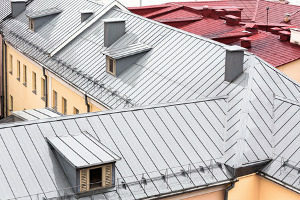 Whatever your residential roofing needs, whether an entire re-roofing project or a simple roof restoration, Dirt Connections is here to help. Contact us today to find out which roof repair method is right for your home!